It’s the last week of August. 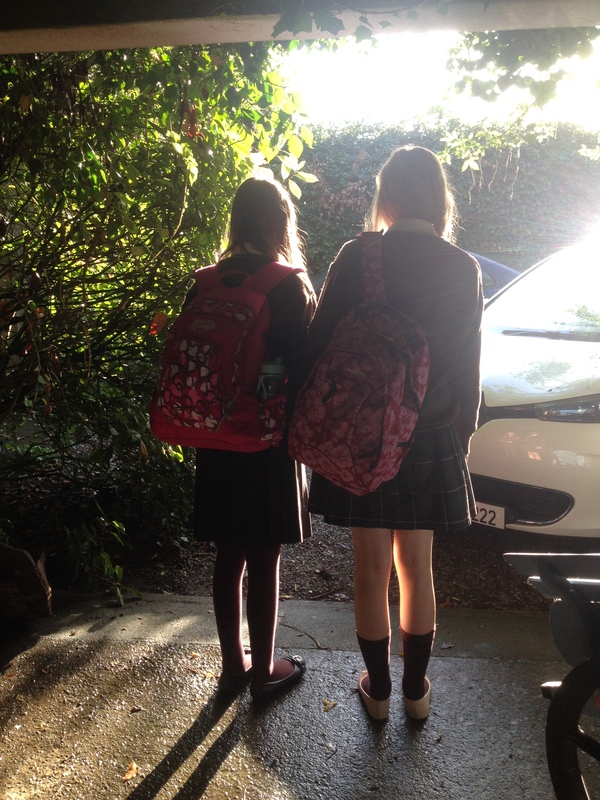 The younger children are back to school and the rain hasn’t stopped falling. In fact, it has pretty much been raining non stop since last Sunday morning. Now I usually can’t remember what the weather was like yesterday, never mind last Sunday morning, but there’s a reason. You see, months and months ago, I promised some friends that I would cook for them during the summer. Last Saturday I kept my promise. 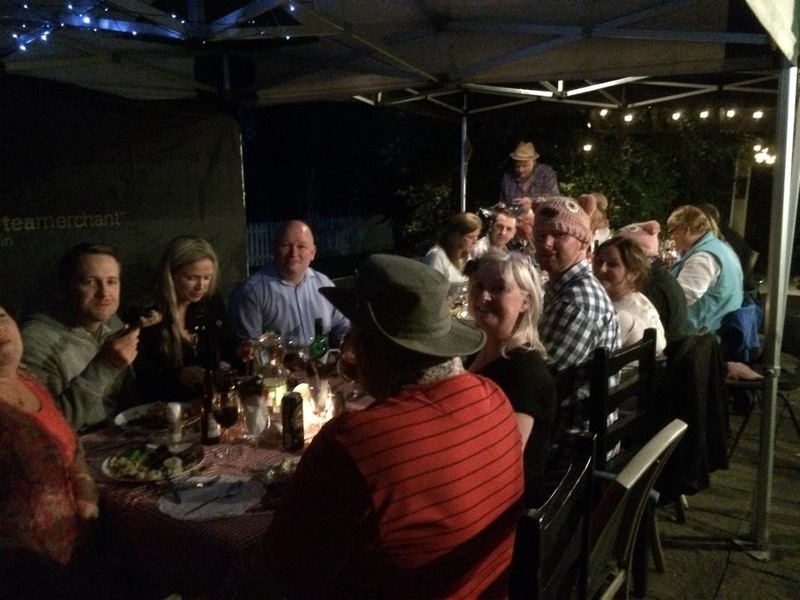 I had warned my (kinda) apprehensive guests that this would be an outdoor event – I’d cook outside and we would all eat outside. My theme was a hat and cushion party (they had to wear a hat to keep the heat in and a cushion to keep their bums warm – makes perfect sense to me!). In the run up to last Saturday my poor husband thought I had taken leave of my senses – my guest list was now just over 20 people and I had no real shelter against the weather. Many of these people had never been to Hunters Lodge, although they are well aware of the mayhem that is my life. Could I not just have a party indoors like regular folk? Nope, I said outdoors and outdoors we would be, and apart from a pop-up gazebo and a fire in an old barrel, we would be at the mercy of the elements for this little soirée. Talk about having the blessings of the Gods – the sun shone all day Saturday and there wasn’t a drop of rain throughout Saturday night. And that’s why I remember the day the rain started because first thing Sunday morning it started to pour and hasn’t stopped since. Of course, some of my friends thought I had a back up plan, but the truth was I didn’t. Well you know on “Come Dine With Me” when the host says “oh I’ve never made this before”? I always think that’s completely ridiculous! Surely, you’d practice before inviting guests right? Wrong. 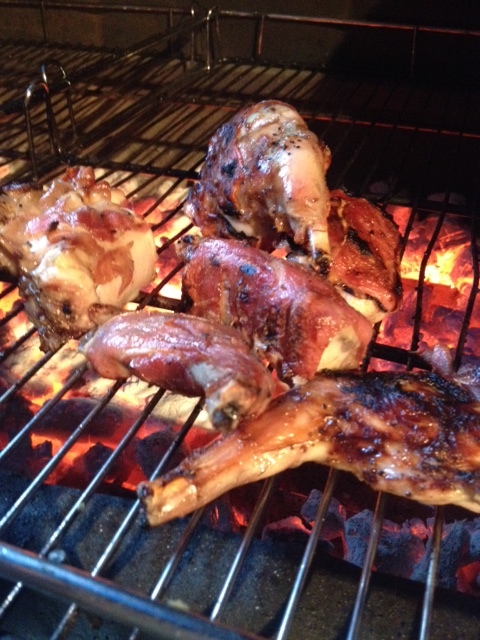 I have never cooked rabbit and I have never wrapped fish in wet newspaper to cook. Nor have I braised snails for three hours. Yep, my guests were to be the latest victims of my “experiments”..
I’m afraid I only got a few photos on my phone but it will give you an idea of what we had..
Rabbit wrapped in Serrano ham – it was tender and succulent. 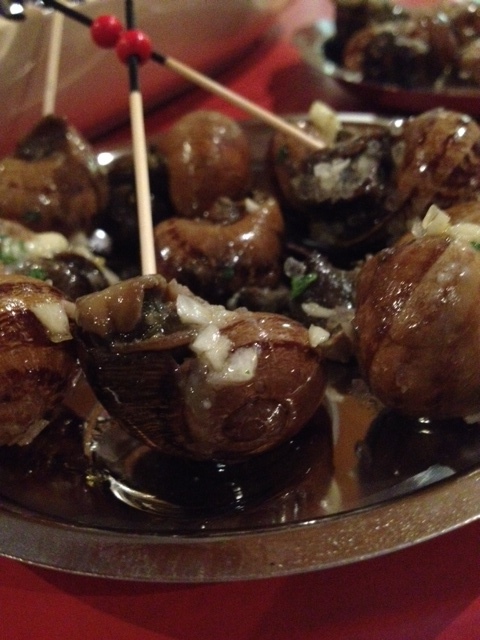 Escargot Bourguignonne – braised for three hours and finished in a garlic butter. The escargot were a gift from Gaelic Escargot. 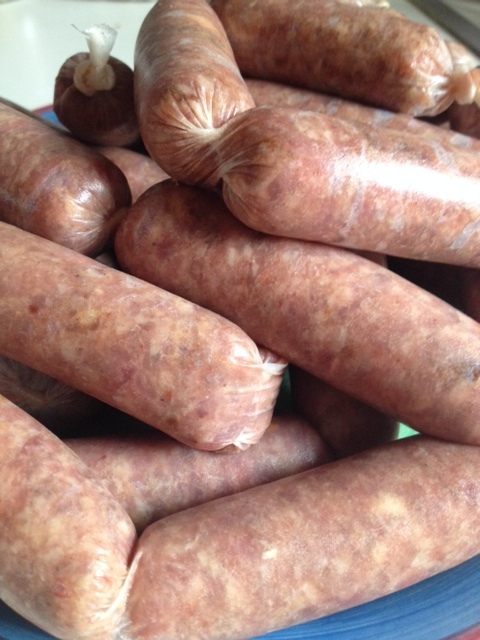 Homemade chilli and 5 spice duck sausages and plum and honey duck sausages – made by my own fair hands (forgot to take a photo when they were cooked..). 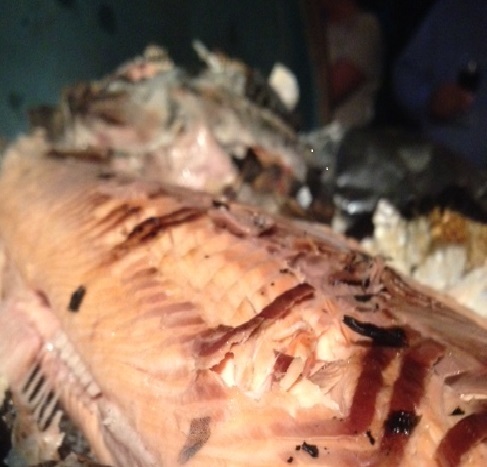 Salmon barbecued in wet newspaper – caught by my favourite mentalist, Keith and cooked by my good friend Derek. Sticky pork belly ribs and smoky bacon with cheddar beef burgers, a big bowl of floury potatoes, breads and salads completed the feast. We ate and drank and laughed and danced and sang and laughed some more into the wee small hours. I had great plans to bake apples in the glowing embers of the barbie, but in the best Hunters Lodge tradition, we ended up toasting marshmallows around the fire (expertly constructed by Eamonn from half a barrel). As the fire died out we enjoyed bread and cheese and a superb apple layer cake made by the Cakey-Love Queen that is Babaduck – fantastic! It was perfect. It was real. It was the best fun and has provided me with lots of memories to cherish as the nights close in and the rain continues to fall. Join me at Taste of Carlow this Sunday August 31st at 3pm – I’ll be talking about Food from an Irish Garden, baking soda bread, making butter and more.. It was a bloody brilliant night. Memories of which are slowly returning to me (booze + age). One of those slightly madcap events that you remember for a very long time. I love your home, your chickens, your geese and your Eamo. So glad you all had a great evening and all your food looks scrumptious.